Go inside the directory which is to be password protected. In this case lets take it as /home/username/public_html/secret. Create a file named .htaccess, open it using the text editor and add the following lines. The AuthName specified here will be displayed in the web browser dialog box when someone tries to access the password protected directory. Access the file via url (http://example.com/location.php) and it will display the complete location of your files on that server. Delete the location.php file, it might pose a security threat later. 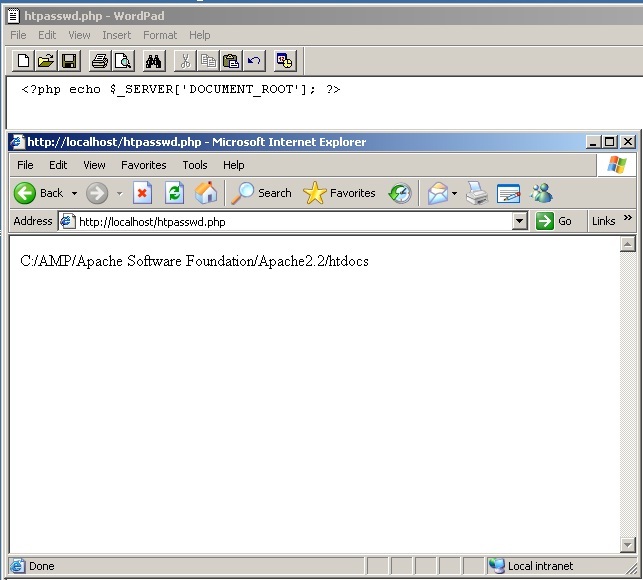 Now according to the above image if you placed the .htpasswd file outside the htdocs folder then the AuthUserFile location should be "C:/AMP/Apache Software Foundation/Apache2.2/.htpasswd". The Require option is to grant/restrict access to particular users. If it is set to valid-user then all the users specified in the .htpasswd can login. If you want only Mike and John to be allowed the set it as Require user Mike John. Save the .htaccess file and move on to the testing part. Username and/or password is incorrect. You may have mistyped the username/password and the case is incorrect. There is a syntax error in the .htpasswd file. Make sure only one username password combination is entered per line and the password should be encrypted for .htpasswd file. 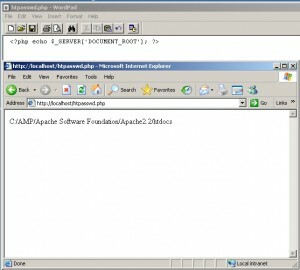 The location of htpasswd specified in the .htaccess file for AuthUserFile could be incorrect. You should specify the entire directory location. When the web browser prompts you for credentials if you press cancel a 401 error is encountered and an “Authorization Required” error is displayed. Note: Even though this method password protects your directories the password entered from your browser are sent to the server in an unencrypted form. Use this method only to add an extra layer of security for protecting administration panels and backends.